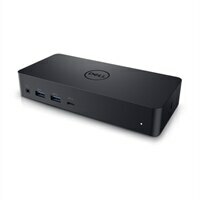 Dell Universal Dock - D6000Conveniently dock any laptop equipped with USB-C or USB3.0 ports with the Dell Universal Dock - D6000. You’ll be able to connect up to three 4K displays simultaneously. A single USB-C cable connection allows you to transfer audio, video, data and power - enabling a fast and convenient docking experience. It also eliminates the need for an additional power adapter, keeping your desk neat and tidy.